Many people ask me how I train my dogs for hunting. 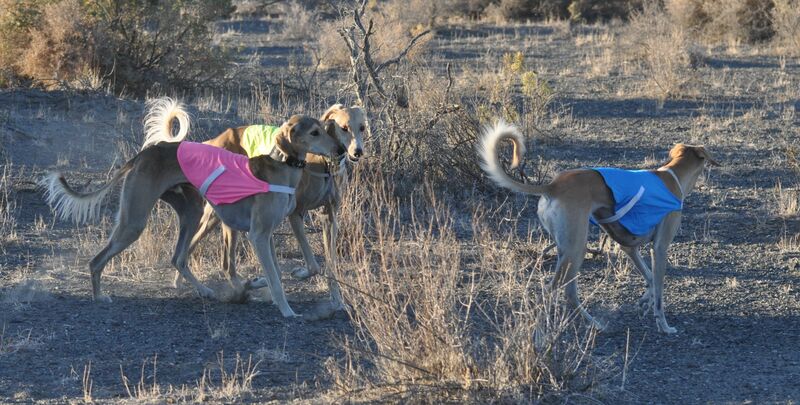 But the truth is, with this type of hunting (open field coursing) the actual training part is very minimal and is more about your dog’s instinctual abilities and experience. One of the biggest parts of training our dogs in the field is the recall. It is always important that your dog learn “come,” especially when your dog will be off lead. We start training their recall very early (8-10 weeks old). One of the easiest ways is to carry treats with you in the field, then hide behind a bush and call them. Once the puppy finds you, praise them a lot and give them a treat. It is good for them to learn that while out in the field, they should always be aware of where you are. This recall training should be constantly reinforced at home as well. Our dogs will chase their hares very far (sometimes a couple miles away), and this is where the instinctual senses kick in for them. It is helpful for young dogs to run with experienced dogs so that they have someone to follow back, but for the most part, a dog’s sense of direction is instinctual. They use the shadows from the sun, sight, sound, and smell to find their way back to you. When training your puppy or young dog, it is important that in the beginning, you use a whistle to signal to them where you are. A whistle travels much farther than your voice, and in case of emergency situations where your dog might get confused or lost; it is helpful to have them whistle trained. Still, most of your dog’s training comes with experience. They will learn that after a long course, you are the one that has the water; therefore you will always be a source that they will want to return to. If they get turned around, they will learn to stop and listen for your whistle to reorient themselves. Just remember, your dog’s ability to hunt is instinctual, that instinct is supported by training, which in turn is strengthened by reinforcement, experience, and conditioning. How has experience helped your puppy’s hunting ability?